The Final Voyage of the Princess Sophia: Did They All Have to Die? Surrey, British Columbia, Canada: Heritage House Pub Co Ltd, 1999. First Edition . Paperback. Fine/No Jacket. 8vo - over 7¾ - 9¾" tall. Fine green color pictorial trade paperback. (1999), 8vo, 192pp. "Relive the drama and tragedy of the Inside Passage's worst maritime disaster in which More than 350 people died and the reputation of Canadian Pacific's coastal service was forever tarnished." 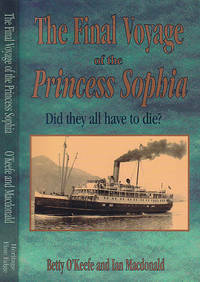 Title: The Final Voyage of the Princess Sophia: Did They All Have to Die?